Sledging across the Adelie Land plateau - from a photo by Douglas Mawson. From 1911-1914, Douglas Mawson was head of the Australasian Antarctic Expedition exploring the area around Commonwealth Bay in Adelie Land, one of the coldest and windiest places on earth. 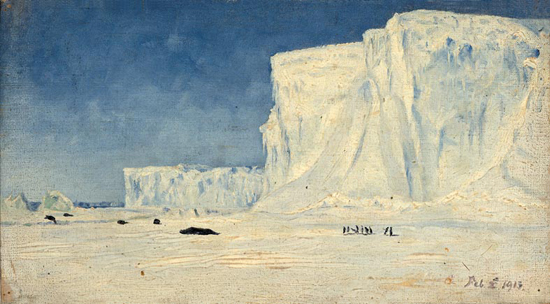 The “newspaper” he and his men produced – the Adelie Blizzard – proved crucial in propping up faltering morale during the long months at the Cape Denison base-camp as the group over-wintered for the second (unplanned) year. 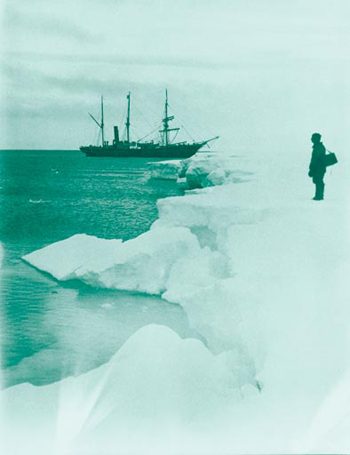 One hundred years after the “Aurora” set sail for the great southern land, a group of enthusiasts (the Friends of the State Library of South Australia) have retrieved the original copies of the Adelie Blizzard from the State Museum archives and published Mawson’s Antarctic newspaper in facsimile form. The publication of this testament to the resilience of the human spirit fulfils (albeit with some delay) the wishes of expedition doctor Archie MacLean, the newspaper’s chief editor and proponent. It was the ancient Greeks who first envisaged Antarctica, suggesting the existence of an antithesis to the Arctic which would preserve the symmetry of all the known landmasses in the world. But it was not until 1820 that the first sighting of Antarctica was made by Russian explorers, although Cook in 1773 was the first to sail below the Antarctic circle only to be blocked by field ice. Due to the hostility of the environment, the Earth’s southern-most continent remained largely unknown up till the very end of the 19th century. In 1898, the British “Southern Cross Expedition” led by Norwegian-born explorer and schoolmaster Carsten Borchgrevink, ushered in the so-called Heroic Age of Antarctic Exploration. This Heroic Age lasted around 25 years, with 16 different expeditions – including famously those led by Shackleton, Amundsen and Scott – launched by eight different countries. These exploratory trips into the icy Antarctic wilderness were characterized by the minimal technological resources available and the extraordinary powers of human endurance required. On December 2, 1911, a group of scientists and adventurers led by geologist Douglas Mawson left Hobart (Tasmania) for the Antarctica on board the “Aurora”. The vessel, a sturdy 3-masted sailing ship with auxiliary engine power, was captained by John Davis King, who had worked closely with Mawson on the planning and provisioning of the voyage. The party was bound for Macquarie Island, around 1,500 kilometres to the south and then onward to explore the great unknown. They were equipped for a year’s scientific study and exploration of the continental mainland beyond the ice pack. Having survived a rather rough crossing, the expedition landed on Macquarie Island on December 11 and set up a base camp and, most importantly, a wireless station. Leaving a small group to man the base, the Aurora set sail again on December 23, and made landfall on January 7, 1912 at a place which Mawson named Commonwealth Bay. 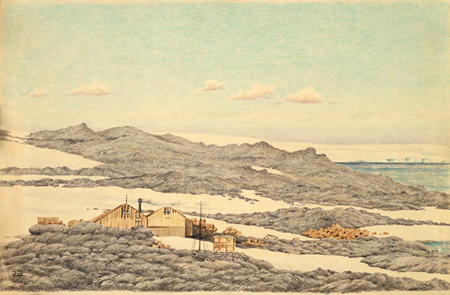 Here the expedition established their main base-camp at Cape Denison, and the “Aurora” made her way back to Hobart with plans to return the following December. 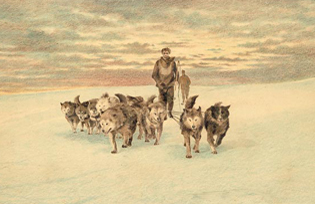 The 18-stong team at Cape Denison was mainly made up of young Australian and New Zealand university graduates plus a few men recruited in London: Lieutenant Ninnis of the Royal Fusiliers who accompanied the sledge dogs on the Aurora’s trip from London to Australia, Dr. Mertz, an expert Swiss mountaineer and F.H. Bickerton, a mechanic, who was in charge of the air-tractor sledge. Despite the weather, sledging parties were undertaken to explore and map the coast and inland regions near the base. Scientific and meteorological observations were taken – and recorded in great detail. As well as the two huts at the base, various outstations and food depots were also established. Setting up a radio mast – no mean feat in the hurricane-force winds – was one of the team’s major – and continuing – projects. Mawson was to be the first to bring radio to Antarctica to report weather phenomena. On November 10, 1912 Mawson, Mertz and Ninnis set off on a sledging expedition to explore the coast to the far east of the base. They took with them two dog teams and enough provisions to keep themselves and their sixteen dogs plentifully supplied for the planned two-month trek. Three weeks into the trip disaster struck. Ninnis was swallowed up by a crevasse along with a team of six dogs and the sledge which was carrying most of the food and their tent. The accident occurred when the expedition was 480 kilometres east of the main base. Mertz and Mawson turned back immediately, but the drastically reduced supplies meant they ended up being forced to eat the remaining dogs. Mertz went mad and died and Mawson struggled on alone through unimaginable difficulties finally reaching Cape Denison on February 8, 1913 – just hours after the “Aurora” had departed. The six volunteers who had stayed behind to continue the search for the ill-fated trio radioed the news to the ship, but bad weather and the increasing pack ice made her return impossible. The team at Cape Denison was now reduced to Mawson and five members of the original expedition, plus the newly-arrived wireless operator Sidney Jeffreys. They had been left with abundant supplies of food and medicine by the “Aurora”, but the prospect of over-wintering another year at the base camp cannot have been a pleasant one. The group also had two dead companions to mourn and no further sledging trips to plan. Mawson’s physical and mental health, which had been compromised by the extreme hardships he had endured, gave the expedition doctor Archie McLean plenty to do. As time went by McLean also found himself having to deal with the growing mental instability of the new wireless operator Jeffreys. McLean held an Arts Degree as well as a Degree in Medicine from the University of Sydney and his medical training had included work at a Sydney psychiatric hospital. It was in fact he who suggested the creation of a newspaper – to boost the men’s flagging morale, to alleviate boredom and to provide a positive influence on the group’s dynamics. It also served to create a semblance of normality in a completely abnormal situation. The Adelie Blizzard was not the first, nor the last, Antarctic publication but it was pioneering in its inclusion of real news events received over the wireless. The main bulk of the “copy” was provided by contributions from the team: Alfred Hodgeman, the cartographer and sketch artist; meteorologist Cecil Madigan; Bickerton; Edward Bage, the astronomer and assistant magnetician; Mawson; Jeffreys and McLean. Only one copy was made per issue, which McLean typed out laboriously on the expedition’s Smith Premier typewriter. Numerous freehand sketches embellished each of the five issues which were printed over seven months – in April, May, June, August and October of 1913. The “launch” of each new issue involved the newspaper being read aloud as it was passed around between the men. In all, the seven of them produced a total of 217 pages over the five issues. Extract from Statics and Antarctics Midwinter’s Day on 22 June: Divine service was held during the afternoon. In the evening, the hut was dressed with bunting, and everyone except the cook was attired in his ‘best’ (….) The opening legend (on the evening’s special menu) was as follows: Now is the winter of our discontent made glorious summer…………. The never-ending saga of the wireless mast – continually being torn down by the high winds – is also documented, but the tragic sledging trip is barely mentioned apart from an “In Memoriam” poem at the beginning of the first issue dedicated to the group’s lost comrades. Extract from Editorial August 5th A red letter day! On emerging this morning, the landscape was almost enveloped in soft, powdery snow, a north-east breeze was blowing, and ‘sago’ grains were falling thickly. (….) The aerial was put together and hoisted, a jury mast was affixed to the southern supporting mast, and by dusk had been securely stayed with the aerial in position. The wireless job was finished! After dinner, communication with Macquarie Island was re-established and two messages were received. Humourous advertisements and notices were a highlight of every issue: this from June advertising the delights of The Archipelago College: Charmingly situated on the aromatic rookeries of Mackellar Islands, with extensive cricket and football grounds on virgin sea-ice, lightning ski-slopes and toboggan runs on the mainland and an undiminished supply of salubrious Polar air. Humour and maintaining an amused perspective on life was highly prized in contributions to the Adelie Blizzard and often transcended the “Boy’s Own” level of the advertisements – This from the August Editorial: To a man we were glad when the July hurricanes were over, and though it is nice to see the world’s wind records being broken, our sporting instincts have atrophied under the continual strain. As time wore on the men’s longing for a return to “civilisation” became more and more evident. This extract from the October Editorial: The South used to be a fertile source of ideas (……. however) the fact is that the South has become a name for hopeless sterility and we have turned our faces and thoughts through 180 degrees to the blissful North. Here at least is a limitless sphere of interest – human interest. An end to their enforced isolation finally came with the return of the “Aurora” on December 12 1913. By December 24 their two-year expedition was over and on February 5, 1914 the “Aurora” set sail for Australia. Back in civilisation, McLean’s efforts to have the Adelie Blizzard published met with failure – being overshadowed by the tragic fate of Scott’s bid to reach the South Pole (1912) and the imminent return of Shackleton’s Imperial Trans-Antarctic expedition (1914-17). McLean was philosophical about it: “In these times of war … greater issues seem to crowd out and dwarf our small concerns” (Letter to Douglas Mawson November 1916). Indeed many of the seven enlisted upon their return . Bage was killed at Gallipoli and McLean, badly gassed , died shortly after being sent home. 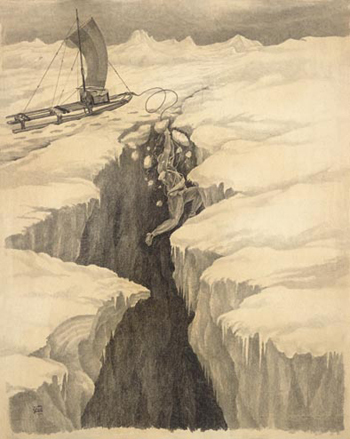 Mawson, who had optimistically included many references to the newspaper in his account of the expedition The Home of the Blizzard, removed all mention of it in his 1932 abridged edition. The Adelie Blizzard was consigned to the expedition’s archives in the South Australian Museum. Illustrations by Dutch marine artist, Joseph van Waterschoot van der Gracht, who travelled south with the supply ship in the summer of 1912-13, except where indicated. For more information regarding the new facsimile versions of The Adelie Blizzard visit the website of Australiana Publications The group produces beautiful hand-bound limited edition facsimiles of hard-to-get books , mostly on early Australian exploration . The Adelie Blizzard is now also available in a lavish large-format paperback edition.